SFIC Melt and Pour Bases have the most options to choose from. These bases are also referred to as the “premium” or “house” bases. SFIC is the manufacturer of the bases, and has been producing soap bases since 1967. If you’d like to learn more about SFIC, click here. The ingredients primarily consist of coconut oil, palm oil, safflower oil, glycerin, water and sodium hydroxide. The remaining ingredients depend on the base. For example, the Goat Milk Melt and Pour Base is the only SFIC base that contains goat milk, and the Hemp Melt and Pour Soap Base is the only base that contains hemp seed oil. Can’t decide which base is the perfect one for you? The Melt and Pour Sampler Kit includes one pound of the most popular bases. These bases come in three size options: 1 pound, 10 pounds and 50 pounds. The 1 pound blocks (shown below) come wrapped and labeled. The 10 pound and 50 pound options are shipped unwrapped and come in random size blocks. 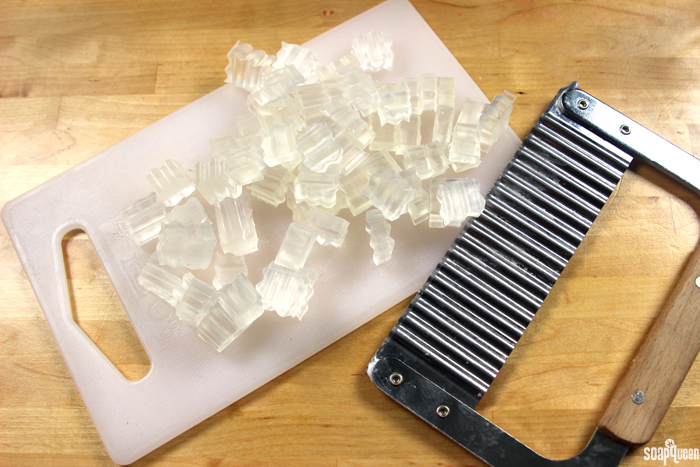 Because melt and pour is chopped into small pieces before melting, the size of the block doesn’t make much difference. If you prefer wrapped, consistent sized blocks, ordering multiple 1 pound blocks is the way to go. =) Some of the more popular bases also come in 25 pound blocks. These include Clear Melt and Pour Base, Goat Milk Melt and Pour Base and White Melt and Pour Base. All of the SFIC bases are made with high quality ingredients, and do not contain detergents to create lather, such as SLS. Because of the high quality, they are a little bit more expensive than other base options. To compare and contrast the ingredients of these bases, check out the list below! If you are looking for a more cost effective base, the Bramble Berry Bulk Melt and Pour Bases are a great option. Unique to Bramble Berry, you won’t find this formula anywhere else. The bulk bases are made with a higher amount of glycerin than the “Premium” bases, and contain SLS (Sodium Lauryl Sulfate). Sodium lauryl sulfate is a synthetic lathering agent that is used to give the bulk bases a creamy lather. These bases feel amazing on the skin, but if you prefer a more “natural” base, the premium SFIC bases may be a better option for you. Check out the ingredients below! The minimum purchase size of Bramble Berry Bulk Bases are 25 pounds. The bases come in 25 pound blocks, which are encased in a plastic bag inside of the box. This is poured directly into the box by the soap maker, so there are usually little bubbles or foam at the top of the block. For tips on cutting the big block of soap up, click here to see step-by-step instructions on wrangling this economical soap base easily. The Stephenson melt and pour bases are a new addition to the Bramble Berry product line. These bases are created by Stephenson Personal Care, a company that offers a wide variety of personal care bases including lotion, conditioner and more. You can find all their products here. Bramble Berry currently offers these melt and pour soap bases by Stephenson: African Black Soap Melt and Pour, Goat Milk Melt and Pour, Oatmeal and Shea Melt and Pour, SLS Free Clear Melt and Pour, Jelly Melt and Pour and Suspending Melt and Pour. All of these bases have unique properties that make them distinct options from both the bulk bases, and the premium SFIC bases. The Jelly Melt and Pour Base has a fun, wiggly texture that makes it completely different from all other melt and pour options. Click here to see it in action in the Shimmery Summer Soap Jellies. The Suspending Melt and Pour Base has a thicker texture than most bases, which makes it perfect for suspending heavier additives like jojoba beads. If you’re new to melt and pour soap, and are looking for more information on how to use the bases, check out the blog posts below! There are so many fun techniques that can be achieved with melt and pour. You can also use melt and pour as embeds within cold process as seen in the Gold Mine Cold Process Soap. Melt and pour soap can also be used to create frosting, as shown in the Whipped Soap Cupcakes video on Soap Queen TV. In addition to the posts below, watch the Basics of Melt and Pour Soapmaking Series on Soap Queen TV (see the first episode below!) This series includes information about fragrance, layers, embedding and more. Hello, I am having trouble with my M&P base. After adding fragrance oil and mica it becomes almost instantly very thick and “gummy”. It literary takes seconds, there is no way to pour it at around 53-53 C. Could it be fragrance oil? I thought they could be a problem with CP soaps but M&P is safe? Or could it be the base itself, when I got it a lid and box were a bit cracked, could the base become drier and that’s why it acts up? Thank you for any advice. How long are you microwaving that base? I’m wondering if it is burnt or possibly a bit old/dry. I thought it would be the case and i tried it again. What surprises me the soap is softer than the base it is made of. Weird or not? I don’t know. What kind of color and oil are you adding to the base, and how much? Also, are you adding any extra oil or butter? I really want to start my own business from home making soaps, bathbombs etc. I was just wondering if you could give me some tips on how i have to start and do i need any type of certificate to be able to sell products. That’s awesome, congrats on starting your business. There are a few things to consider before starting, including insurance, sales tax, etc. Also, some states do require business licenses. You can learn more in our three-part series about selling your soap. I’ll link that below. 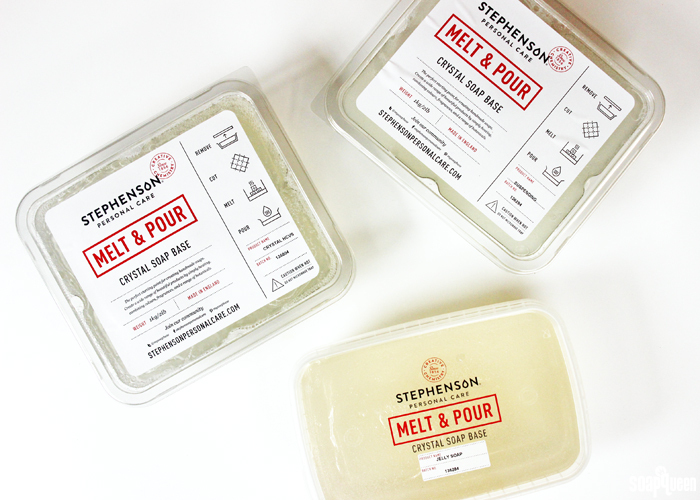 Hello, in this blog post you mention Stephenson vanilla stable melt and pour. When I click on its link, it brings me to the Bramble Berry homepage. Does Bramble Berry carry this product anymore? Hi Kelsey, I did try to make a melt and pour soap, and when i poured the alcohol, the entire mixture overflowed and flooded the floor, i wonder what causes that and how can it be prevented. Thanks for all the helpful info on your website! I’m new to soap making, but volunteered to help with my friend’s soap making baby shower which will be using MP bases. Sorry to ask such a beginner’s question, but what kind of a time frame are we looking at from beginning to end? I fell in love with the idea of melt and pour bases when I was pregnant; however, when I used your goat milk base, it sweated uncontrollably. It was pretty much unsalvagable. I wrapped it, put it in a Tupperware container, and used silica packets, but every time I got it out, it started sweating again. This made it slimy and unattractive. I wish there was a better way to use the MP bases. If im using the SFIC mp bases do I need to list the ingredients on my soaps if selling them? I did melt and pour for some years and have moved on to cold process, since I felt that MP really had some creative limitations. Loving the CP! But about a month ago, I made two loaves of MP with both clear and opaque bases (probably olive oil/hemp/shea/goat). I want to reuse them and do something besides just remelting and playing with them. What would happen if I cut the loaves in thin sheets and then used them in CP loaves? Would there be any sort of adverse reaction like glycerin rivers or spotting? 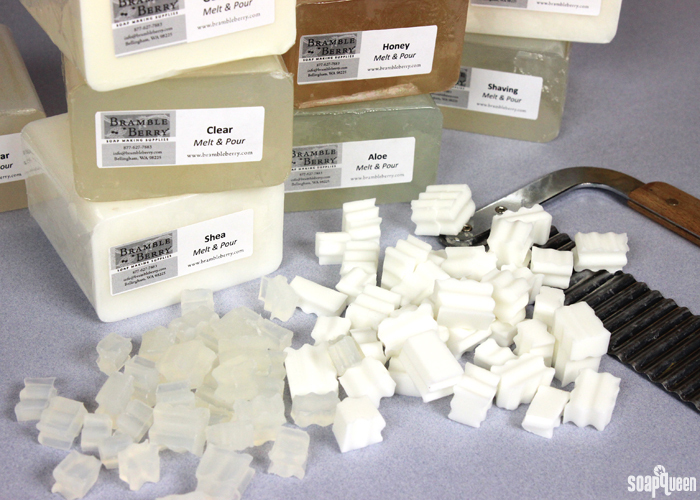 In cold process soap, the extra glycerin in the melt and pour soap can make it sweat or morph in the recipe. Because of that, we recommend using LCP (like cold process) bases. They have less glycerin, so there is less chance they will sweat or morph! Hi, I’m new to this process as well. It looked rather simple, so I decided to try to make some simple bars of M&P soap with the honey base for my daughter’s baby shower. However, when the bars of soap are removed from the mold, I leave fingerprints and smudges on them. How do I prevent this? How do I get a more finished look to the soap? Hi, I’m new to Melt & Pour and i made a batch using glycerin to create my colorant with a mica, just overnight it now has a filmy bubbly type texture on the top of it and I’m able to wipe it off but I’m wondering if the glycerin in the colorant is what caused this? It sounds like the soap has glycerin dew. Melt and pour bases have additional glycerin added during the manufacturing process. That additional glycerin, plus the glycerin mixed with the colorant, can cause dew or “sweating,” especially in humid climates. You can prevent that dew from forming! Wrapping the soap tightly with plastic wrap and shrink wrapping it on will protect it from moisture. It can also help to use a dehumidifer, or place silica packets near your bars. I have a niece that is allergic to coconut & soybean oil. Is there a base without these? She loves my soaps but they all contain coconut for sure. I’m new to soaping but enjoying being creative! Please could you tell me if your soap supplies are cruelty-free as this is important to me. Thank you! I’d hate to ask a stupid question, but if I wanted to make just one soap bar how many squares would I cut off the 1 pound batch? Can you add aloe or shea butter to melt and pour? How do you determine how much to add? Where’s the palm oil sourced from? Our palm oil is sustainably sourced! We’re affiliated with vendors of the RSPO and support sustainable palm oil. I have 3 colors that I need to gently let mix a bit when I pour, and can never get all 3 to be perfectly melted at the same time. I’m going low and slow, but it’s very hard. If you find that one of your colors has hardened up, you can pop it back in the microwave for 5-10 seconds to get it fluid again. When I’m working with several colors, I like to take the temperature of each. If one is hardened but one is around 130F, I’ll melt the hardened one, then throw the 130F in the microwave for just about 2-5 seconds. That will get them around the same temperature so you can swirl. The bulk goat milk soap is my mainstay and I purchase it 150 lbs at a time. I supplement my soap-making with aloe and hemp soaps and will layer those in the top with goat milk on the bottom. Hemp is my absolute favorite. I love the suds. 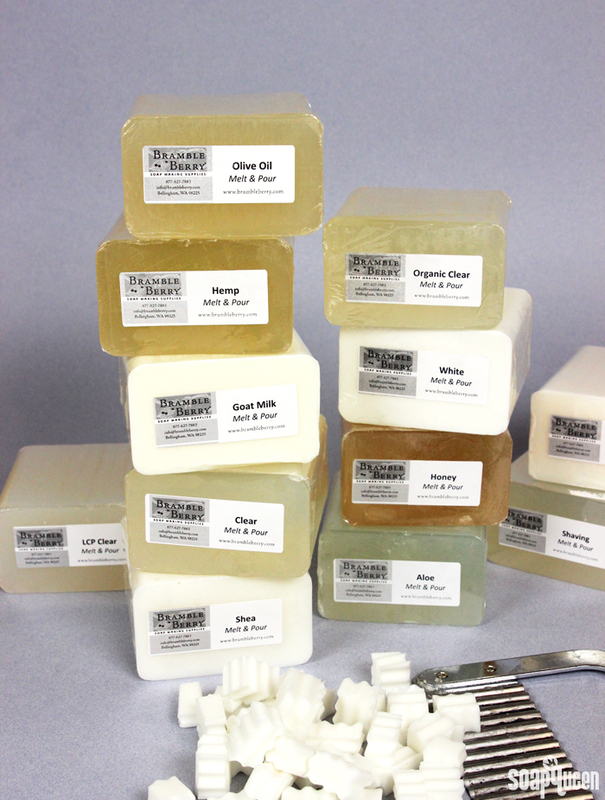 Melt and pour allows me to produce quality soaps at a good price point. And I can make one bar at a time if need be. Thanks, Brambleberry for supplying all of my soaping needs!